(339/14)240-256 Jones Street; Roosevelt Hotel, Marlton Manor (1982). Stores and mid-priced hotel with 160 rooms with baths. 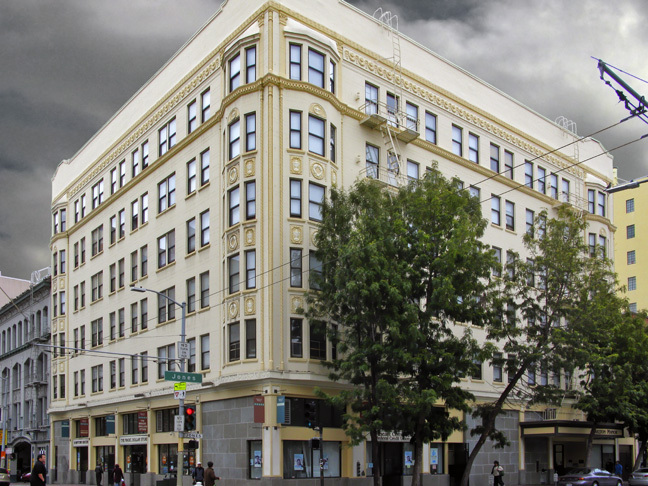 6B stories; steel frame and reinforced concrete structure; stucco facade; five-story bay windows, belt courses; three-part vertical composition; Renaissance/Baroque ornamentation; marquee over entry. Alterations: storefronts, vestibule, and lobby remodeled, cornice removed. Owners: Alexander and Rene Vayssie 1925, Mercy Housing with A.F. Evans Company and Marlton Manor 2003. Architects: Fabre and Hildebrand. 1925.